Dr. Daniel Rowlett is the city's namesake. Leaving Kentucky, he settled here in 1836 and bought a large tract of land. Although no early population figures are available, it's safe to say the population was scant until the arrival of the railroad in 1886. The town was granted a post office in 1889 and in the early 1890s Rowlett had several basic businesses and a population of around 200. By the mid-1890s, Rowlett's population had nearly doubled but by 1914, it had been reduced back to 200 residents. Rowlett was "electrified" in 1924 and suffered through the Great Depression along with the rest of the country. By 1952 the population was still less than 300 but the residents decided to incorporate that year. Lake Ray Hubbard was completed in 1971 and suddenly Rowlett found itself growing at a dizzying pace. 1973 reported 1600 people which increased to 2500 two years later. It topped 10,000 by the late 1980s and the 1990 census counted over 23,000 residents which came extremely close to doubling for the 2000 census. 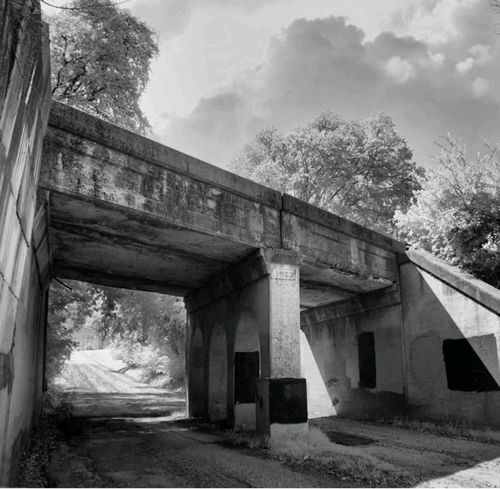 "One of two of the original train trestles from the Bankhead Highway that remain in Rowlett, Texas. This one is near Lake Ray Hubbard, and that is actually an extension of Main Street that runs under it.. and into the lake!"